Darts: Martin Schindler beats Ron Meulenkamp in round one Schindler will now go through to round two of the International Darts Open in Riesa. It is thought that the game of darts originated from a game that soldiers would play by throwing arrows at a barrel. The standard board with 20 on the top was devised in 1896 by Lancashire carpenter Brian Gamlin. The design was intended to penalise inaccuracy. The first custom-made darts were made from wood. Metal darts were introduced in the 1950s, initially made from brass as it was cheap and easy to use. From the 1970s, plastic was widely used for the shaft and flight, whilst tungsten more commonly replaced brass for the barrel. The standard height from the floor to the bulls-eye is 5ft 8" (1.73m), which is considered to be the eye-level of a man 6 ft (1.83m) tall. The board is 17.75" (45.1cm) in diameter and the oche- the line from where the darts are thrown - is placed 7ft 9.25" (2.37m) from the board. The dartboard is divided into 20 sections numbering 1-20. There are also a series of concentric rings which affect the totals. If a dart lands in the outer ring, the player will score double the points for that section (e.g. double 20). If a dart lands in the inner ring, the player scores triple the points for that section (e.g. triple 19). A dart in the middle of the board or bulls-eye will score 50 points, or 25 points if it lands in the ring immediately next to the bull. The normal game starts at 501 and the player or team aims to be the first to reach zero. Each player throws 3 darts at a time and their total is deducted each time from 501. In order to reach zero and end the game, the player must finish by throwing a double (e.g. if a player has 36 remaining, then the dart must land in double 18 or any combination which results in the final dart landing in the double section - namely in the outer ring). Once the player has thrown a double, he/she will have been deemed to win a leg. A match may be divided by the number of legs won or by sets. A set will be subdivided into the best of an agreed number of legs. For example in a best of 5 set, a player will win it if he/she wins 3 out of 5 legs. The first World Championship hosted by the British Darts Organisation (BDO) was played in 1978 and was won by Leighton Rees. In the early years thanks to a broadcast deal with the BBC, the tournament made celebrities of the likes of Eric Bristow, Jocky Wilson and John Lowe. In 1992, a breakaway championship known as the PDC was formed. By far the leading personality has been Phil "The Power" Taylor who has won 16 world titles including 10 in 11 years between 1995 and 2006. 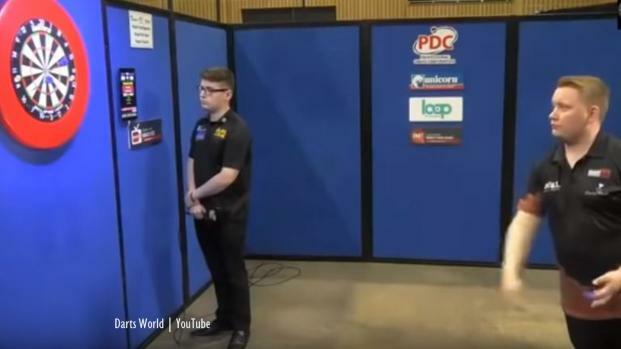 The PDC has its competitions broadcast by Sky TV in the UK. Only one player, Raymond van Barnefield, has won world titles from the BDO and the PDC and he holds 5 world titles in total. Adrian Lewis lost twice on unlucky night 13, while double victory for the Dutchman edged him closer to the play-offs. Darts’ Premier League action from Cardiff as a Michael van Gerwen whitewash secured his play-off place. Battle of the Dutch maestros sees darting legend van Barneveld come out on top in Aberdeen. The Premier League of darts resumed after ‘Judgement Night’ with action from Sheffield. Week nine of the Betway Premier League witnessed the elimination of two players from this year’s competition. Night eight of the Betway Premier League saw Michael van Gerwen stay top but Belgian ace lose again.